Narcy’s performance united the crowd on Friday night. Photos Matthieu Marin. It was just past midnight, but June was still dancing; warming the hearts of the attendees and restoring a feeling of positivity and hope that had been missing since the the Jan. 29 shooting that left six people dead, and seventeen kids without a father. Her father, Ian Campeau—otherwise known as DJ NDN—and Bear Witness, are of the Nipissing and Cayuga First Nations, respectively. They’re also two parts of the three-person electronic music group, A Tribe Called Red, who came to close the Yusra benefit show last Friday. 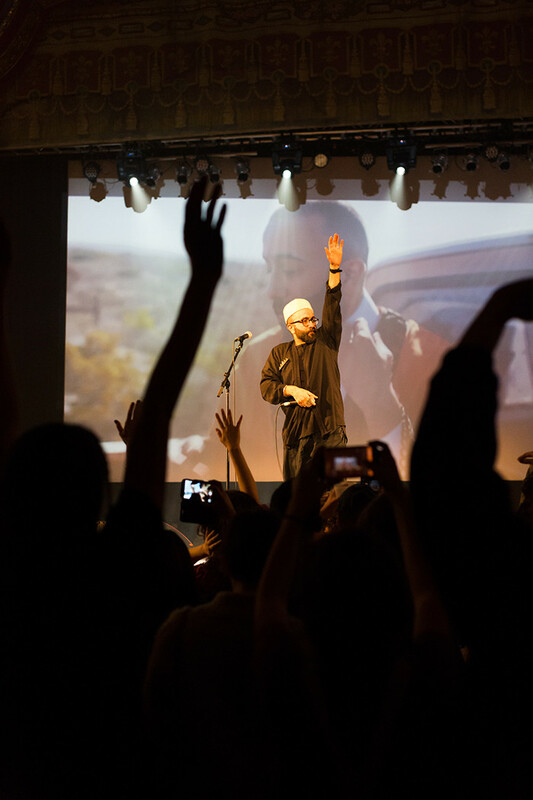 The impromptu concert was pulled together by Iraqi-Canadian rapper, The Narcicyst—commonly known as Narcy. 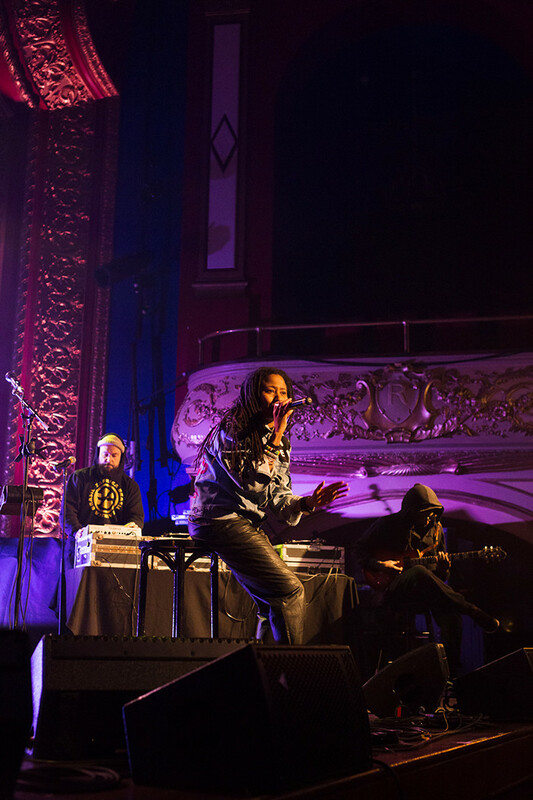 A collaborative effort between his collective The Medium and POP Montreal, the Feb. 10 show hosted a variety of musical acts—many of whom are friends with the well-known rapper. Tribe’s music video, “R.E.D.,” which features Narcy, Yasiin Bey and Black Bear, is currently up for a Juno Award as Video of the Year in 2017. Ticket sales, donations and merch purchases were amassed for the families of the victims of the Sainte-Foy shooting. Dan Seligman, POP Montreal’s creative director, estimated that between $4,000 to $5,000 was collected. The Medium is a Montreal-based collective lead by Iraqi-Canadian rapper, Yassin Alsalmad, or Narcy, but many Concordia students know him as their professor. This semester, Narcy is teaching a class called “Bigger than Hip-Hop” in the Hall Building. DJ NDN and Bear Witness were guest speakers for last week’s class. With recent events in Quebec City, the class discussion focused on exploring the effects and trauma of these types of incidents. Addressing social issues like xenophobia and Islamophobia have been consistent themes in Narcy’s work. There are lots of talented musicians, visual artists and filmmakers who are creating and collaborating on high-level artistic projects, explained Narcy. Yet the spotlight still seems to overlook many of the strongest artists around him. “[The media] tends to go to Muslims when something happens to Muslims or when Muslims ‘do something,’” he said. Highlighting people from various communities, showcasing their work—this is the change that happens at the front lines of media norms. Narcy said that the problem lies deep within institutional structure. One of those professionals is Nantali Indongo. Nantali Indogo, a.k.a. Tali Taliwah asked the crowd to sing with her. While Indongo played a short twelve-minute set during the performance under her stage name Tali Taliwah, her long-time presence in arts and culture production at the CBC has made her the go-to person when it comes to issues of race around the newsroom. Indongo reiterated the fact that editorial leaders need to consider prioritizing stories that involve marginalized peoples, or participate in mainstream arts ongoing in ways that break from the status quo. Her performance at the Rialto was candid. Sitting on a stool at the front of the stage, Indongo pulled out a red notebook before talking about the song she had finished composing the night before. June kept the energy going with her cute dance moves during the last set. On stage with her two bandmates, she said “We need to send love to Sainte-Foy.” The crowd actively listened, clapped, and sang with Indongo throughout her performance. All of the evening’s performances brought the crowd together. Narcy performed a few songs on stage as well, but seemed to be making space for other artists to come and share their music with the crowd. Then finally, just before midnight, following a precursor DJ set from Buddablaze, the guys from A Tribe Called Red hit the stage. 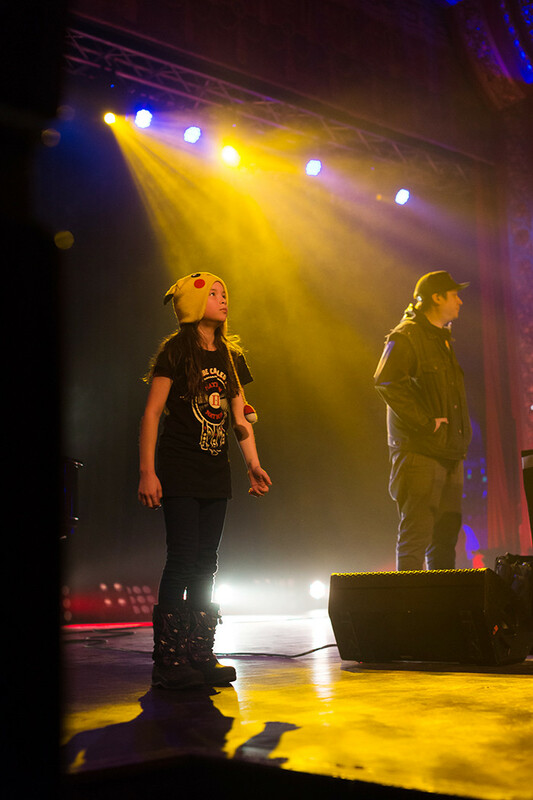 While Bear Witness and DJ NDN mixed behind the booth, Campeau’s kid got the crowd going from the side—stealing everyone’s heart while wearing a knitted Pikachu hat.